Fall 2017 saw the most intense hurricane season recorded in Atlantic history. Both hurricane Maria and hurricane Irma caused billions of dollars in damage and left many island occupants without electricity or access to food and water. “The hurricane truly made me appreciate how quickly things can change,” said one dentist forced to leave his practice in Puerto Rico after 24 years. The destruction caused by the hurricanes had dramatic effects on so many, including practicing dentists in Puerto Rico and the US Virgin Islands who were in turn displaced to Florida to try to re-start their lives. 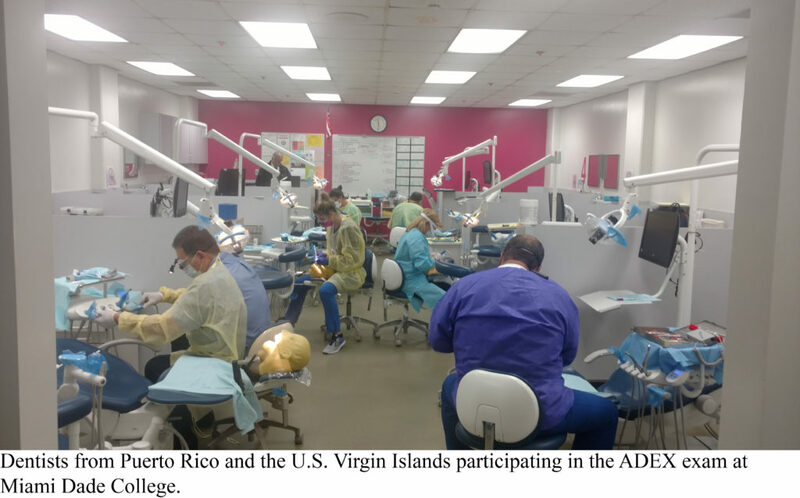 To assist these individuals, the Commission on Dental Competency Assessments (CDCA), Florida Department of Health, Florida Board of Dentistry, Florida Dental Association and Miami Dade College decided to join forces late last year to expedite a special administration of the ADEX dental licensure exam on February 11-12, 2018 at Miami Dade College. Florida Department of Health received several inquiries and we quickly identified the special needs of the affected individuals. We then reached out to the CDCA to see what could be done.” said TJ Tejera, DMD, MD, Chair, Florida Board of Dentistry. “Our CDCA leadership was eager to find a way to assist these dentists and new Florida residents, consistent with our mission. We knew time was of the essence and went to work right away to put together an exam with minimal participant cost.” said Alex Vandiver, CEO. Besides Florida, successfully completing the ADEX exam requirement offers these dentists the ability to apply for license in 46 other accepting jurisdictions. “After Hurricanes Maria and Irma, my office was severely affected due to the lack of electric power and water. I was with no power for about 3 months and a big number of patients moved to different states including Florida, California, Texas and Chicago,” shared one exam candidate, but many had similar stories. When surveyed on their plans after achieving Florida licensure, exam participants responded they will continue to practice and serve their new communities. “After I achieve my FL dental license, I am planning to join a practice where I can start doing what I love the most…really good dentistry,” shared one of the dentists. On June 11-12, 2015, the CDCA held its Annual Steering Committee Meeting & Educators Conference in Linthicum, MD. Educators and state dental board representatives from throughout the United States and the Commonwealth of Jamaica heard about the recently piloted ADEX Patient Centered CIF examination (CDCA’s “Buffalo Model”), which serves as a modification of the traditional dental licensure exam format shifting the focus of the exam from the candidate to the patient. During the Educators Conference Dr. Michael Glick, Dean, and Dr. Joe Gambacorta, Assistant Dean of Clinical Affairs, from the University at Buffalo School of Dental Medicine, both presented on how the Patient Centered CIF was implemented and received at the University at Buffalo. You will find links to both of their video presentations below as well as the panel discussion that followed featuring: Dean Glick, Assistant Dean Gambacorta, Dr. Guy Shampaine, ADEX CEO, and Dr. Dave Perkins, CDCA Chair. Planning for this pilot exam began in November of 2014 between the New York State Dental Association (NYSDA), the University at Buffalo (UB) and the CDCA. The pilot exam was developed to address concerns about patient testing in examinations. The resulting Patient Centered CIF exam was approved by ADEX last year and piloted five times at the University at Buffalo between January and May 2015. While the new exam included the same content, scoring, and criteria of all other ADEX examinations, the Patient Centered CIF also had several key exam administration modifications. Faculty & Curriculum integration.1 During the pilot exams, the CDCA calibrated with faculty on identifying correct and appropriate lesions specifically for the exams. Faculty then approved lesions on patients prior to the exams. On exam days all treatment occurred on patients of record. If the candidate treatment was incomplete, all patients received treatment to completion after the exam and under faculty supervision. Patient eligibility and procurement.2 Candidates did not have to search for patients for this exam. Treatment was only rendered on patients of record as part of an appropriately sequenced treatment plan. Multiple exam dates available and retakes offered at all exams.3 To prevent delay of appropriate and timely treatment on patients, multiple exam dates were scheduled with the University at Buffalo. Furthermore, candidates with no-show patients had additional opportunities to take the exam without an additional cost. Candidates that did not pass the examination were also able to challenge the exam at a later date for a retake fee. Exam part of normal clinic day. Since the exam was integrated into a normal clinic day, there was minimal disruption to the candidates’ academic schedule. The Patient Centered CIF pilot exam also received positive feedback from dental candidates. Presence of faculty helped establish examiner validity and confidence for students. No need to search for “ideal” lesions. Flexible scheduling reduced the stress of “all or nothing weekend exam”. No extracted teeth to mount and radiographs to take. It felt like a regular day at school. If you are interested in learning more about the ADEX Patient Centered CIF examination (CDCA’s “Buffalo Model”), please contact a CDCA team member. 1 The integrity of the exam was never compromised, since examiners and faculty were kept separate during the examination. 2 Schools always have the option to allow outside patients. 3 Multiple exam dates are offered at the option of the school and will be tailored accordingly.